Simple yet appealing, this maroon coloured pouch from Yelloe is a must-have for women on the go. Featuring ample space, this pouch can easily accommodate all your toiletries and make-up essentials. The zip closure on the top ensures safety of your belongings. Creative and dexterous professionals have helped us in presenting the first class quality of Red Undergarment Kit. Their rugged construction and elegant design, makes these products highly demanded. We are offering Fancy Toiletry Bag to the clients. Offered range is very handy to keep the shampoo and other toiletries organized and separate for easy retrieval. 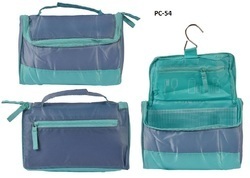 Fancy Toiletry Bag is one of the most convenient options for ladies who are always on the go and travel a lot. Being a leader in the industry, we are engaged in offering a qualitative range of Shaving Kit Bag to our clients.